Romania’s Southeast Region covers about a quarter of the country, and has a topography and atmosphere akin to that of southern France. Almost surrounded by water (with the Danube flowing in the west, the Danube-Black Sea Canal taking its course in the south, and the Black Sea to the east), this region has a gorgeous coastline that has become a favourite European summer getaway. It has even been nicknamed the Romanian Riviera. The region is wonderfully green and fertile. The ancient Macin mountain range is a beautiful backdrop for rolling plains and plateaus, many blanketed with vineyards and croplands. The forests of Tulcea and Galati are nature reserves. Those in Tulcea are unique, as their humid canopies shelter tropical flora. In places such as Dobrogea, Buzaului, and Vran Cea in the northern mountains, there are medieval monasteries constructed entirely out of wood and covered in ornate frescoes. The region’s manufacturing industries—textiles, food, steel, petrochemical production, and auto assembly—are believed to pose risks to the region’s natural resources. Other sectors, however, are starting to pick up a lot of the business in the area. Agrotourism, especially around the Danube Delta and the nearby mountains, has intensified. The health resorts in Soteja, Sarata Monteoru, and Teahirghiol are celebrated destinations, teeming with people during the holidays. The county of Constanta is on the Black Sea coast. It has the largest port in Romania and a popular beach. It is also where the Danube links up with the Black Sea via the wide, deep Danube-Black Sea Canal. Constanta’s agricultural plains produce cereals and wines. The capital of the county is the city of Constanta, and one of its major urban centres is the plush resort town of Mamaia. Constanta City’s history goes back to the 6th century, and it boasts archaeological treasures worth exploring. A number of sites can be found at the centre and the waterfront. 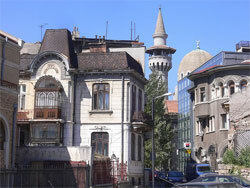 Popular sights are the 18th century Genoese-built lighthouse, Saligny Monument, Victoria Park, Mahmudiye Mosque and the Art Noveau-style grand casino built between the two World Wars. Constanta’s port is one of the largest in Europe, and being on the Black Sea coast, it is a popular stop or point of origin for cruises. The city and the north and south of Constanta have many beaches, although the nicest resorts are farther away from the city itself. One can enjoy walking along the waterfront promenade in Constanta or check out the museums, shops, and open-air restaurants. At night, the city comes alive with nightclubs and cabarets. The construction of 15 20-storey apartment buildings in a residential development in Constanta has just been completed. It has 3,200 units in all. An earlier project consisting of 18 apartment blocks with 414 units offers affordable rates to families and young professionals. Mamaia is Romania’s largest beach resort. It is quite a posh town situated between the picturesque Siutghiol Lake and the Black Sea. Staying here would be quite expensive. Its beach is lovely. A tree-lined boulevard makes a good backdrop for its stretch of fine soft sand and gently sloping underwater profile, one reason why it is popular with families with young children. In fact, the beach is designed for family activities. There are water sports as well as beach games, biking, and tennis. The Aqua Magic Park at the entrance of the beach and the Telegondola (cable car) are very popular. Mamaia has many luxury hotels, a vacation village and a casino, and an array of bars, pubs, nightclubs restaurants and shops. The beach is inhabited mostly during summer, and the summer theatre holds shows and festivals. Residential and industrial areas and important port activities are concentrated in the north and south areas. Unfortunately, Mamaia has an erosion problem, due to the extension dikes at the nearby Midia harbour. Costinesti was once a small fishing village, but has now evolved into a popular summer resort. It has developed much since the Communist era, when it only had a few villa complexes and a hotel. Some have been renovated and acquired a more modern look, while more private construction is taking place on the north side. Costinesti attracts youngsters and hosts an international student summer camp every year. Its two discos provide much of the nightlife. Summer months are livelier with parties and performances by bands from all over the country. Costinesti has a small lake inland, surrounded by several lodges. Mangalia is a city on the Black Sea coast. Its port is used mainly for ship repairs and military purposes. Its main draw is Neptun, a stunning summer beach resort with two beautiful lakes. Its party scene is popular with singles and young couples, with nightclubs, discos, and bars lining the beach. There are restaurants, fast foods, shops, and supermarkets as well. The white sand beach, the lakes, and the climate of the Black Sea coast are known for their natural cure factors. Some parts of the beach are designated for cold mud applications, wave therapy, and aeroheliotherapy. It has a balneal polyclinic with modern facilities.